Tantallon’s Calum Hill pulled off the biggest shock so far in the Scottish Amateur Championship with a thumping win over one of the seeds at Royal Aberdeen. The 20-year-old, who qualified for last year’s Scottish Open at Gullane, hammered Cawder’s Jamie Savage 6&4 to reach the last 32. “I was pleased when I saw the draw and I was pretty up for it,” admitted Hill, who is three-quarters of the way through a four-year scholarship at the University of Louisiana-Monroe. 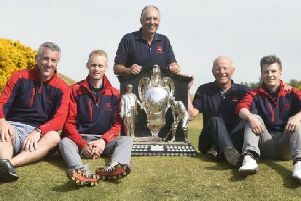 He’s set to be joined by his team-mates from there in September for a pre-season tour that will involve playing some courses in East Lothian as well as a match against Stanford at Kingsbarns. “I didn’t really come into this week with any expectations, but I am feeling confident about my game,” added Hill, who reached the last 16 at Muirfield 12 months ago. Also still standing is Euan McIntosh, who has just earned a Scotland return at 47 and also been awarded honorary membership at Turnhouse. “It’s been a bit of a whirlwind recently and most of the timeI’m enjoying it,” admitted McIntosh, having “struggled” to win two of his three matches so far. “I’ll not keep winning if I continue playing like that,” he added.